Home » News & Events » Are you worried about someone with dementia? If you have concerns about how a family member or friend might be coping with their dementia while still living in their own home, then you might be interested in the Leazes Homes bungalows in Dinnington. 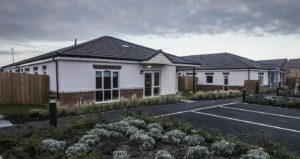 Set in a new housing estate in the peaceful village of Dinnington, the bungalows at Holmes Close provide safe and comfortable living options and were specifically designed to suit the needs of people who have dementia. There are five bungalows, each with five bedrooms with their own private w/c, and modern, communal kitchens, dining spaces and living rooms. They are fully accessible and built to ensure that they will still be suitable as residents’ needs change. 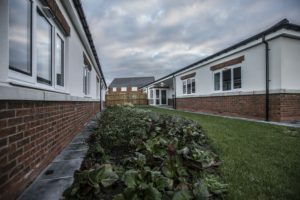 Residents of the bungalows live alongside each other, helping them to form friendships and avoid feelings of loneliness, and 24 hour support and care is provided onsite by experts from Dementia Care. Each of the bungalows also has its own landscaped garden connected to the gardens of the other bungalows, meaning residents are free to wander safely between them. The bungalows and nearby housing estate, Sheraton Park, were completed in the summer of 2017 and Dinnington is a tranquil village with useful local amenities and direct transport routes into Newcastle. The bungalows are owned by Leazes Homes, an affordable housing provider, and were built in partnership with Newcastle City Council.